Top Notch! Would recommend them and put a stamp on it. My word is as good as gold. Paul was professional,knowledgeable and honest. Explained repair on my 52" SONY would almost cost as much as a new TV. Buying new TV from Best Buy tomorrow. Refreshing not to have someone try and screw you over. this company is very professional & trustworthy. I highly recommend them for TV repair! Paul was very professional & takes pride in his work. It doesn't matter how long the repair takes; he will stay & do it right. It is so refreshing to have found a company that offers good service & is trustworthy. I highly recommend!!!! 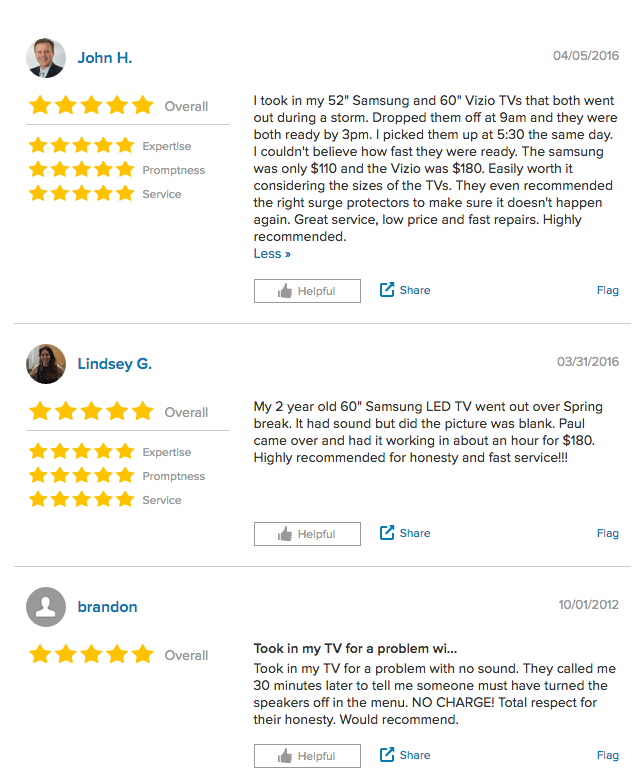 I took in my 52" Samsung and 60" Vizio TVs that both went out during a storm. Dropped them off at 9am and they were both ready by 3pm. I picked them up at 5:30 the same day. I couldn't believe how fast they were ready. The samsung was only $110 and the Vizio was $180. Easily worth it considering the sizes of the TVs. They even recommended the right surge protectors to make sure it doesn't happen again. Great service, low price and fast repairs. Highly recommended.